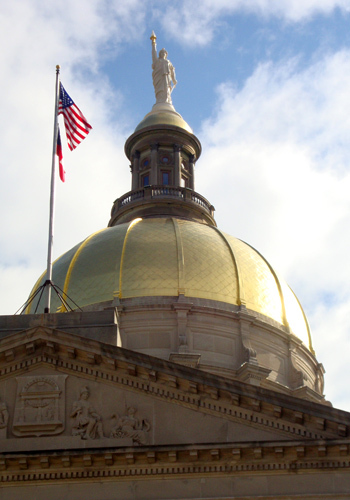 The unmistakable gold dome of the Georgia Capitol Building shines like a beacon in the Atlanta skyline that marks the center of Georgia state government and the heart of "The New South." 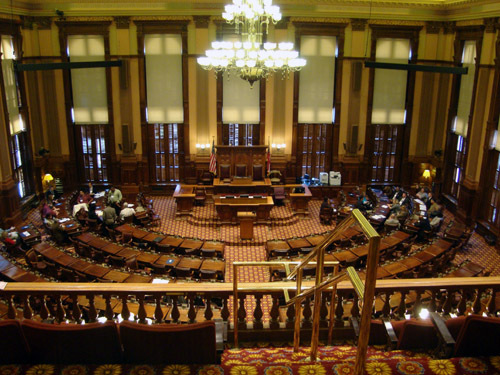 The Georgia Capitol's similarity to the U.S. Capitol in Washington, D.C., was intentional. It served as a message that post-Civil War Georgia government was reaffirming its ties and loyalties to the federal government. The exterior of the dome was, however, not always gold. Sixty-nine years after it opened its doors in 1889, the people of Dahlonega, Georgia, donated 40 ounces of gold to guild the dome—a publicity move advertising that the first gold rush in the United states in fact took place in their community. The dome was immediately gilded, in 1958, and has since been re-gilded twice. On the particular chilly morning I visited the Capitol, I had the pleasure of an individual guided tour of the Capitol Building. 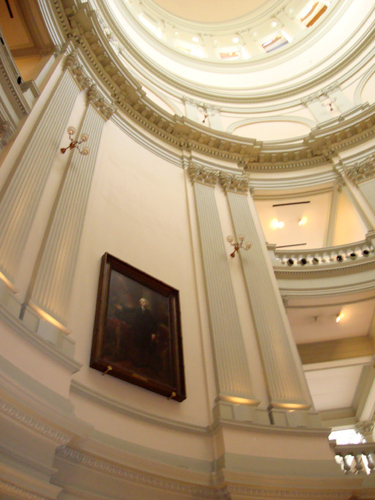 We started in the Rotunda where the dome's ceiling towered three stories above us; portraits and marble busts of famous Americans (some Georgians) surrounded us; and a Georgia marble and glass floor supported and illuminated us. ﻿Standing in the center of the Rotunda, on the second floor, one can see all four sides of the building. Also on this level, in the east and west wings, are portraits of former Governors, including the only Georgian to ever be elected to the office of President of the United States, Jimmy Carter. The one exception of the Governor-theme portrait exhibit on the second floor (portraits of other notable statesmen appear on other floors) is that of civil rights activist Dr. Martin Luther King, Jr., which was placed by then-Governor, Jimmy Carter, to symbolize the changing landscape of Georgia government. The General Assembly chambers are located on the third floor of the Capitol Building. Photographs of the chambers are permitted when the General Assembly is not in session…a rare opportunity, I thought. Photography throughout the remainder of the Capitol Building is, again surprisingly, permitted. The House of Representatives (180 members) chamber is on the west side of the building. Although the House was not in session when I visited, there were meetings taking place when we arrived. My tour guide took me inside the entryway of the chamber and pointed out that one of the two in-process meetings was likely an orientation for recently elected Representatives. The Georgia State Senate (56 members) chamber is on the east side of the Capitol Building. An upstairs gallery, open to the public when the Senate is in session, was also a stop on my tour. A school group was visiting the Senate chamber and their tour guide gave them the opportunity to sit in the "big chair" and make photographs—an excellent enticement to encourage youngsters to learn more about State Government, I think. Since soon after the Capitol Building opened, the position of State Geologist was created and tasked with obtaining and displaying geological specimens to promote Georgia's natural resources. The ensuing museum, located on the Capitol's fourth floor, evolved over the years to include taxidermy, which eventually overcrowded the museum space. 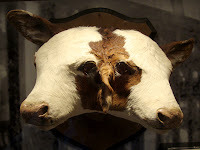 Today, the Georgia Capitol Museum showcases the Capitol and Georgia government, but also contains many artifacts from the original collection, including some oddities such as a two-headed cow (popular with visitors) that was born in Georgia. At the conclusion of the tour, an information-packed 30 minutes, my tour guide released me to explore the Capitol Building to my heart's content. 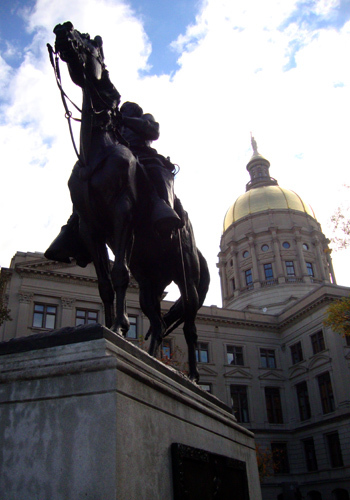 The Georgia Capitol grounds is adorned with statuary monuments, the first placed in 1907. Individuals whose likeness has been immortalized in bronze for visiting Georgians and visitors include John Brown Gordon (the first Georgia Governor to serve in Atlanta), Joseph E. Brown, Richard B. Russell, Eugene Talmadge, Herman Talmadge, Jimmy Carter, and Ellis Amall. Towering Magnolia trees, the pinnacle botanical expression of the South, surround the Capitol on all sides. Scandalous at the time, the exterior of the Capitol Building is covered in sandstone from Indiana. Commendable, even today, the construction of the Capitol, featuring Georgia marble and other local materials, came in under budget—a remarkable feat for any government, right? 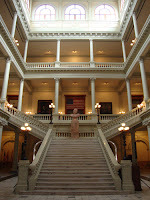 The Georgia Capitol Building was recently renovated to look as it did when its doors opened in 1889, including the wall colors and the light fixtures, which are exact replicas (other than their being electric instead of gas powered). The Georgia Capitol Building became a National Historic Landmark in 1977. The National Park Service of the Department of the Interior recognized the Capitol Building as "an outstanding structure, both architecturally and historically." As a veteran of the U.S. Navy, I think one very cool opportunity is the ability to acquire a commemorative flag, one that has flown over the Georgia Capitol Building, to be presented to members of the armed services or to other citizens in recognition of certain milestones. It's as easy as completing a form and contributing a nominal fee. Surprisingly, the building is very open, in design and access, so much so that it's garnered the nickname "The People's House." The building's north and south wings are available, free of charge (the space is free, catering and other services are available for charge) and relatively easy to reserve, for events such as a press conference, meeting, speech or ceremony. 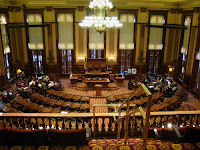 Does my impression with the Georgia Capitol Building warrant a return visit? I will be more than happy to play tour guide for visiting friends and family (and may even soon return on my own). The Capitol is easy to get to, easy to tour, and provides an excellent opportunity to learn about Georgia and its government. Personally, I vote for a return visit. Parking: For a nominal fee - Steve Polk Plaza parking lot (next to the old World of Coca-Cola building) and the public lot at Underground Atlanta, located on Martin Luther King, Jr. Drive. Self-guided tours Monday through Friday 8:00 a.m. – 5:00 p.m. Check the website for blackout dates and times. Good to learn the significance of the gold in the dome.